beautifully said! many times i have described working in a professional kitchen as dancing. everything is choreographed and practiced over and over again a million times. the same routine everyday. get there, check work list, get mise en place, get a speed rack before they are all gone and start the dance. every move within those parameters. i miss it. and i agree, viennoiserie needs the precision of the pastry chef and the "special dough" hands of the baker. Yes! It's like a meditative ballet. Mise en place is one of my favorite passages. And the race for speed racks! So true. When it all comes together, when it works, it's such an unbelievably magnificent experience. Surrounded by glorious ingredients, nothing can beat the hum of a professional pastry kitchen. How lucky we are to have ventured into some of the finest. And luckily for us, our lessons continue. Beautiful photography, beautiful pastry, beautiful - and even beautiful comments! Sigh. Sorry - I meant to say beautiful writing before beautiful comments. The sigh is the same. These look delicious. 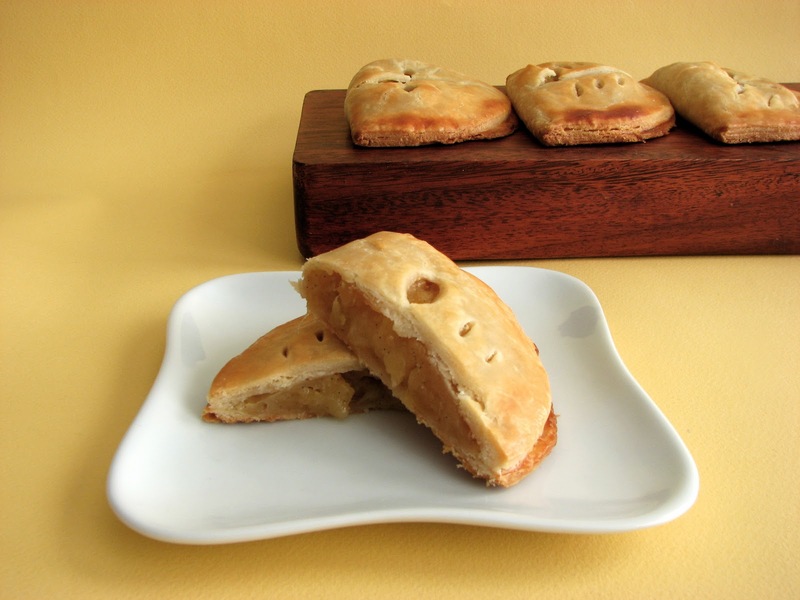 Did you read Molly (Orangette)'s article in October's Bon Appetit about Chaussons aux Pommes? She's with you on the saucier filling. Me? I think your chunky one looks just right. Great pics too! Katherine, someone just sent me a note about Orangette's lovely article and I just found it on the web. 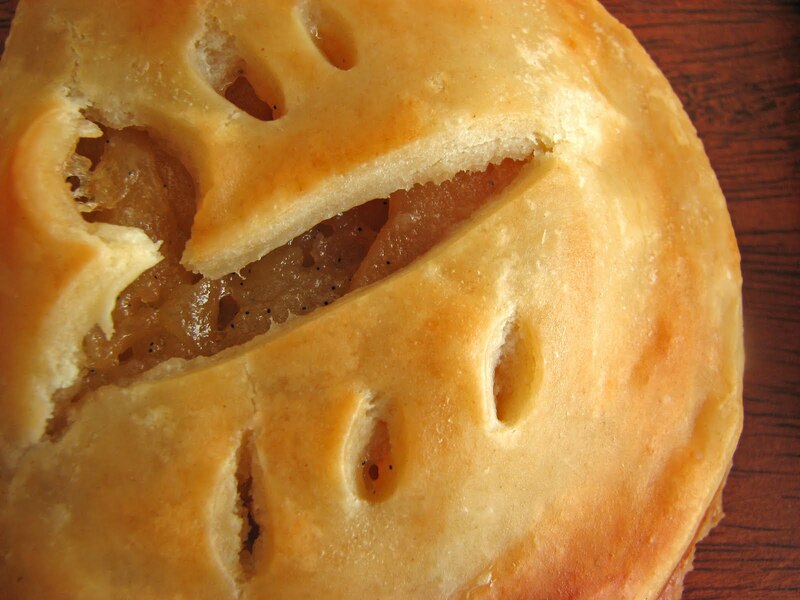 I'm a big texture freak and normally like crunchy/chewy things but for some reason this pastry seems best with the soft luscious apples in a smooth puree. Just incredibly comforting. Yum! How perfect for the season. They look "almost" too pretty to eat! Amazing photos! 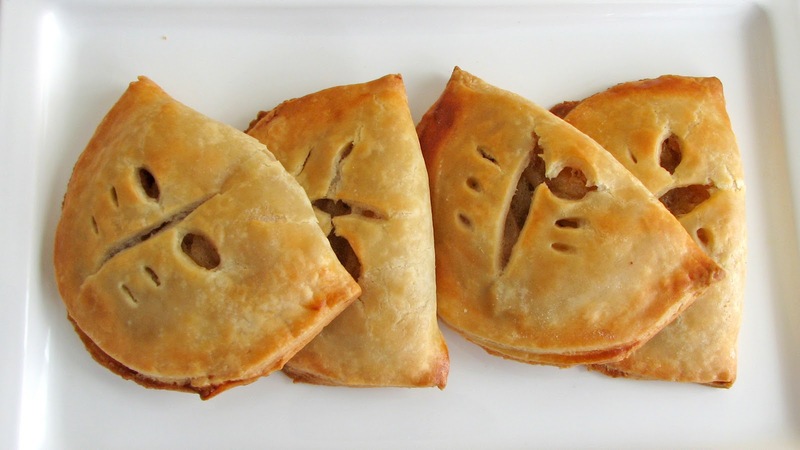 Those turnovers are gorgeous! I love the translations of pastry names, very fun. I love the chunks of apple in the filling--I think I'd go the same way. I like the texture it gives! Yum, these look so beautiful! Thanks for educating me about the three different names for pastry. 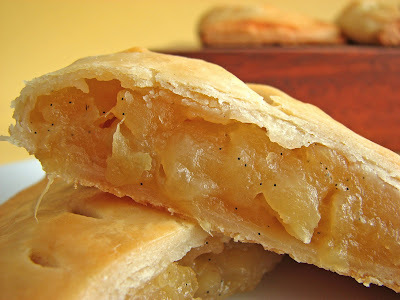 Your turnovers are lovely! Your turnovers look so delicious. I am a texture freak as well but the soft smooth filling sounds perfect. Lovely. Oooo I love these! They look like apple pastry purses. Never tried them before... better buy apples next time I'm at the shops! Chaussons aux pommes! Now, that's a trip back to childhood for me! The quintessiential afternoon bakery pick-me-up!! Well done! I saw this recipe and i had to make it! The only problem was that I am in Italy and i could not find sour cream so i substituted mascarpone and the dough still turned out beautifully! These are delicious because of their simplicity, thank you for posting these!